For the area in Singapore, see Novena, Singapore. For the open-source computer, see Novena (computing platform). 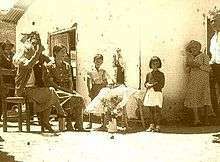 A group of pious women gathered for a novena to Our Lady of Mount Carmel, most likely a mourning event. circa 1940. A booklet with the novena to Our Lady of Peñafrancia, from Binondo, Manila. Imprimatur dated 1867. A novena (from Latin: novem, "nine") is an act of religious pious devotion originating in ancient Christianity, often consisting of private or public prayers repeated for nine successive days in belief of obtaining special intercessory graces. Novenas are most often prayed by members of the Roman Catholic Church, as well as by members of the Anglican Church, Eastern Orthodox Church and Lutheran Church. In addition, novenas have also been used in an ecumenical Christian context, such as those promulgated by Premier Christian Radio in an effort to pray for Church renewal. The prayers are often derived from devotional prayer books, or consist of the recitation of the rosary (a "rosary novena"), or of short prayers through the day. Novena prayers are customarily printed in small booklets, and the novena is often dedicated to a specific angel, saint, a specific Marian title of the Blessed Virgin Mary, or it invokes one of the personages of the Holy Trinity. Within the Roman Catholic discipline, novena prayers for public use must have an Imprimatur, Nihil Obstat, and Imprimi potest. These ecclesiastical sanctions are usually granted by a bishop or any ranking prelate for publication and approval. 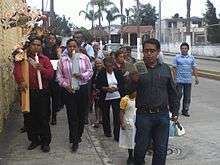 A group of devotees holding a candle novena on the way to church for the Feast of Exaltation of the Holy Cross, Orizaba, Mexico. The practice of the novena may have been influenced from the Medieval practice of holding daily Mass for nine consecutive days for recently departed members of the upper classes and clergy, which itself may trace its origins to an early Greek and Roman custom performed by families, consisting of nine days of mourning after the death of a loved one, followed by a feast, which originally prompted Catholic writers such as St. Augustine, Pseudo-Alcuin and John Beleth to warn Christians not to emulate the custom. Over time, members of Roman Catholic faith began to place less emphasis on the number nine's connection to the pagan custom, and more on its association with the nine months Jesus spent in the womb, the giving up of His spirit at the ninth hour, and the event which occurred in the Upper Room with Twelve Apostles and the Blessed Virgin Mary when they prayed for nine days until the Holy Spirit descended on the Feast of the Pentecost. In the New Testament, this biblical event is often quoted from Acts of the Apostles, 1:12 – 2:5. The Church Fathers also assigned special meaning to the number nine, seeing it as symbolic of imperfect man turning to God in prayer (due to its proximity with the number ten, symbolic of perfection and God). These developments first affected Christian mortuary celebrations, and then carried over to prayer. 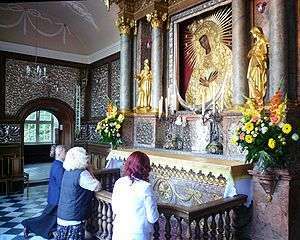 A group of women praying to Our Lady of the Gate of Dawn in Vilnius, Lithuania for petitions. The leader is on the far left. By standard liturgical norms, novenas are performed in church, at home, or anywhere where solemn prayers are appropriate, though some indulgenced novenas require church attendance. Sometimes, a special candle or incense is lit at the beginning of the novena which burns during the nine days of prayer. The first chapter of the General Principles of Sacrosanctum Concilium, #13 is often cited as a guideline regarding the implementations of public novenas. Novena prayers are also practised by Lutheran, Orthodox and Anglican Christians, who hold close or similar beliefs regarding its pious practice. In addition, novenas have also been used in an ecumenical Christian context, such as those promulgated by Premier Christian Radio, in order to pray for Church renewal. 1 2 3 "Novena: nine days of prayer with Premier". Premier Christian Radio. Retrieved 10 April 2015. Novena is an ancient tradition of prayer for nine days between Ascension Day and Pentecost Sunday. Premier is resourcing a Novena to invite the Holy Spirit to bring fresh renewal to the Church and calls on churches across the UK to take part in an ecumenical act of unity and prayer. 1 2 "What is a novena?". Catholic Community of St. Matthew & St. Bernard Church. Retrieved 13 April 2016. Though the novena is primarily a devotion used by members of the Catholic Church, it is also practiced by some Orthodox, Anglican, and Lutheran Christians. 1 2 "What is a novena?". Catholic Community of St. Matthew & St. Bernard Church. Retrieved 10 April 2015. According to Scripture, after Jesus' Ascension into heaven, he told his disciples to pray together in the upper room and devote themselves to constant prayer (Acts 1:14). Doctrine proposes that the Apostles, Blessed Virgin Mary, and other followers of Jesus prayed together for nine consecutive days, concluding in the descent of the Holy Spirit on Pentecost. ↑ Novena to Our Mother of Perpetual Help - Baclaran copy. with Imprimatur. Right Reverend Monsignor Joseph F. Stedman, The New Revised 'Triple' Novena Manual, Confraternity of the Precious Blood, 1975. Barbara Calamari & Sandra DiPasqua, Novena, Penguin Studio, 1999. ISBN 0-670-88444-8.